This document describes how to build, configure, and operate OpenLDAP Software to provide directory services. This includes details on how to configure and run the Standalone LDAP Daemon, slapd(8). It is intended for new and experienced administrators alike. This section provides a basic introduction to directory services and, in particular, the directory services provided by slapd(8). This introduction is only intended to provide enough information so one might get started learning about LDAP, X.500, and directory services. A directory is a specialized database specifically designed for searching and browsing, in additional to supporting basic lookup and update functions. Note: A directory is defined by some as merely a database optimized for read access. This definition, at best, is overly simplistic. Directories tend to contain descriptive, attribute-based information and support sophisticated filtering capabilities. Directories generally do not support complicated transaction or roll-back schemes found in database management systems designed for handling high-volume complex updates. Directory updates are typically simple all-or-nothing changes, if they are allowed at all. Directories are generally tuned to give quick response to high-volume lookup or search operations. They may have the ability to replicate information widely in order to increase availability and reliability, while reducing response time. When directory information is replicated, temporary inconsistencies between the replicas may be okay, as long as inconsistencies are resolved in a timely manner. There are many different ways to provide a directory service. Different methods allow different kinds of information to be stored in the directory, place different requirements on how that information can be referenced, queried and updated, how it is protected from unauthorized access, etc. Some directory services are local, providing service to a restricted context (e.g., the finger service on a single machine). Other services are global, providing service to a much broader context (e.g., the entire Internet). Global services are usually distributed, meaning that the data they contain is spread across many machines, all of which cooperate to provide the directory service. Typically a global service defines a uniform namespace which gives the same view of the data no matter where you are in relation to the data itself. A web directory, such as provided by the Open Directory Project <http://dmoz.org>, is a good example of a directory service. These services catalog web pages and are specifically designed to support browsing and searching. While some consider the Internet Domain Name System (DNS) is an example of a globally distributed directory service, DNS is not browseable nor searchable. It is more properly described as a globally distributed lookup service. LDAP stands for Lightweight Directory Access Protocol. As the name suggests, it is a lightweight protocol for accessing directory services, specifically X.500-based directory services. LDAP runs over TCP/IP or other connection oriented transfer services. LDAP is an IETF Standard Track protocol and is specified in "Lightweight Directory Access Protocol (LDAP) Technical Specification Road Map" RFC4510. This section gives an overview of LDAP from a user's perspective. What kind of information can be stored in the directory? The LDAP information model is based on entries. An entry is a collection of attributes that has a globally-unique Distinguished Name (DN). The DN is used to refer to the entry unambiguously. Each of the entry's attributes has a type and one or more values. The types are typically mnemonic strings, like "cn" for common name, or "mail" for email address. The syntax of values depend on the attribute type. For example, a cn attribute might contain the value Babs Jensen. A mail attribute might contain the value "babs@example.com". A jpegPhoto attribute would contain a photograph in the JPEG (binary) format. How is the information arranged? 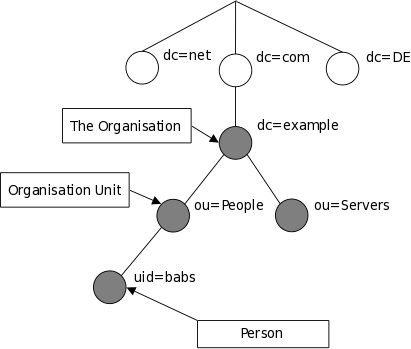 In LDAP, directory entries are arranged in a hierarchical tree-like structure. 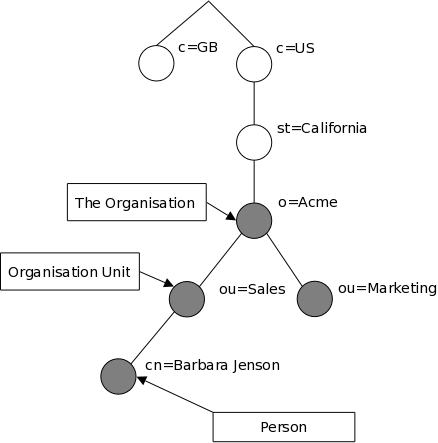 Traditionally, this structure reflected the geographic and/or organizational boundaries. Entries representing countries appear at the top of the tree. Below them are entries representing states and national organizations. Below them might be entries representing organizational units, people, printers, documents, or just about anything else you can think of. Figure 1.1 shows an example LDAP directory tree using traditional naming. The tree may also be arranged based upon Internet domain names. This naming approach is becoming increasing popular as it allows for directory services to be located using the DNS. Figure 1.2 shows an example LDAP directory tree using domain-based naming. In addition, LDAP allows you to control which attributes are required and allowed in an entry through the use of a special attribute called objectClass. The values of the objectClass attribute determine the schema rules the entry must obey. How is the information referenced? An entry is referenced by its distinguished name, which is constructed by taking the name of the entry itself (called the Relative Distinguished Name or RDN) and concatenating the names of its ancestor entries. For example, the entry for Barbara Jensen in the Internet naming example above has an RDN of uid=babs and a DN of uid=babs,ou=People,dc=example,dc=com. The full DN format is described in RFC4514, "LDAP: String Representation of Distinguished Names." How is the information accessed? LDAP defines operations for interrogating and updating the directory. Operations are provided for adding and deleting an entry from the directory, changing an existing entry, and changing the name of an entry. Most of the time, though, LDAP is used to search for information in the directory. The LDAP search operation allows some portion of the directory to be searched for entries that match some criteria specified by a search filter. Information can be requested from each entry that matches the criteria. For example, you might want to search the entire directory subtree at and below dc=example,dc=com for people with the name Barbara Jensen, retrieving the email address of each entry found. LDAP lets you do this easily. Or you might want to search the entries directly below the st=California,c=US entry for organizations with the string Acme in their name, and that have a fax number. LDAP lets you do this too. The next section describes in more detail what you can do with LDAP and how it might be useful to you. How is the information protected from unauthorized access? Some directory services provide no protection, allowing anyone to see the information. LDAP provides a mechanism for a client to authenticate, or prove its identity to a directory server, paving the way for rich access control to protect the information the server contains. LDAP also supports data security (integrity and confidentiality) services. LDAP utilizes a client-server model. One or more LDAP servers contain the data making up the directory information tree (DIT). The client connects to servers and asks it a question. The server responds with an answer and/or with a pointer to where the client can get additional information (typically, another LDAP server). No matter which LDAP server a client connects to, it sees the same view of the directory; a name presented to one LDAP server references the same entry it would at another LDAP server. This is an important feature of a global directory service. Technically, LDAP is a directory access protocol to an X.500 directory service, the OSI directory service. Initially, LDAP clients accessed gateways to the X.500 directory service. This gateway ran LDAP between the client and gateway and X.500's Directory Access Protocol (DAP) between the gateway and the X.500 server. DAP is a heavyweight protocol that operates over a full OSI protocol stack and requires a significant amount of computing resources. LDAP is designed to operate over TCP/IP and provides most of the functionality of DAP at a much lower cost. While LDAP is still used to access X.500 directory service via gateways, LDAP is now more commonly directly implemented in X.500 servers. The Standalone LDAP Daemon, or slapd(8), can be viewed as a lightweight X.500 directory server. That is, it does not implement the X.500's DAP nor does it support the complete X.500 models. If you are already running a X.500 DAP service and you want to continue to do so, you can probably stop reading this guide. This guide is all about running LDAP via slapd(8), without running X.500 DAP. If you are not running X.500 DAP, want to stop running X.500 DAP, or have no immediate plans to run X.500 DAP, read on. It is possible to replicate data from an LDAP directory server to a X.500 DAP DSA. This requires an LDAP/DAP gateway. OpenLDAP Software does not include such a gateway. LDAPv2 is historic (RFC3494). As most so-called LDAPv2 implementations (including slapd(8)) do not conform to the LDAPv2 technical specification, interoperability amongst implementations claiming LDAPv2 support is limited. As LDAPv2 differs significantly from LDAPv3, deploying both LDAPv2 and LDAPv3 simultaneously is quite problematic. LDAPv2 should be avoided. LDAPv2 is disabled by default. This question is raised many times, in different forms. The most common, however, is: Why doesn't OpenLDAP drop Berkeley DB and use a relational database management system (RDBMS) instead? In general, expecting that the sophisticated algorithms implemented by commercial-grade RDBMS would make OpenLDAP be faster or somehow better and, at the same time, permitting sharing of data with other applications. The short answer is that use of an embedded database and custom indexing system allows OpenLDAP to provide greater performance and scalability without loss of reliability. OpenLDAP, since release 2.1, in its main storage-oriented backends (back-bdb and, since 2.2, back-hdb) uses Berkeley DB concurrent / transactional database software. This is the same software used by leading commercial directory software. Now for the long answer. We are all confronted all the time with the choice RDBMSes vs. directories. It is a hard choice and no simple answer exists. It is tempting to think that having a RDBMS backend to the directory solves all problems. However, it is a pig. This is because the data models are very different. Representing directory data with a relational database is going to require splitting data into multiple tables. Think for a moment about the person objectclass. Its definition requires attribute types objectclass, sn and cn and allows attribute types userPassword, telephoneNumber, seeAlso and description. All of these attributes are multivalued, so a normalization requires putting each attribute type in a separate table. Now you have to decide on appropriate keys for those tables. The primary key might be a combination of the DN, but this becomes rather inefficient on most database implementations. The big problem now is that accessing data from one entry requires seeking on different disk areas. On some applications this may be OK but in many applications performance suffers. The only attribute types that can be put in the main table entry are those that are mandatory and single-value. You may add also the optional single-valued attributes and set them to NULL or something if not present. But wait, the entry can have multiple objectclasses and they are organized in an inheritance hierarchy. An entry of objectclass organizationalPerson now has the attributes from person plus a few others and some formerly optional attribute types are now mandatory. What to do? Should we have different tables for the different objectclasses? This way the person would have an entry on the person table, another on organizationalPerson, etc. Or should we get rid of person and put everything on the second table? But what do we do with a filter like (cn=*) where cn is an attribute type that appears in many, many objectclasses. Should we search all possible tables for matching entries? Not very attractive. Once this point is reached, three approaches come to mind. One is to do full normalization so that each attribute type, no matter what, has its own separate table. The simplistic approach where the DN is part of the primary key is extremely wasteful, and calls for an approach where the entry has a unique numeric id that is used instead for the keys and a main table that maps DNs to ids. The approach, anyway, is very inefficient when several attribute types from one or more entries are requested. Such a database, though cumbersomely, can be managed from SQL applications. The second approach is to put the whole entry as a blob in a table shared by all entries regardless of the objectclass and have additional tables that act as indices for the first table. Index tables are not database indices, but are fully managed by the LDAP server-side implementation. However, the database becomes unusable from SQL. And, thus, a fully fledged database system provides little or no advantage. The full generality of the database is unneeded. Much better to use something light and fast, like Berkeley DB. A completely different way to see this is to give up any hopes of implementing the directory data model. In this case, LDAP is used as an access protocol to data that provides only superficially the directory data model. For instance, it may be read only or, where updates are allowed, restrictions are applied, such as making single-value attribute types that would allow for multiple values. Or the impossibility to add new objectclasses to an existing entry or remove one of those present. The restrictions span the range from allowed restrictions (that might be elsewhere the result of access control) to outright violations of the data model. It can be, however, a method to provide LDAP access to preexisting data that is used by other applications. But in the understanding that we don't really have a "directory". OpenLDAP includes back-sql - the backend that makes it possible. It uses ODBC + additional metainformation about translating LDAP queries to SQL queries in your RDBMS schema, providing different levels of access - from read-only to full access depending on RDBMS you use, and your schema. For more information on concept and limitations, see slapd-sql(5) man page, or the Backends section. There are also several examples for several RDBMSes in back-sql/rdbms_depend/* subdirectories. LDAPv3: slapd implements version 3 of Lightweight Directory Access Protocol. slapd supports LDAP over both IPv4 and IPv6 and Unix IPC. Simple Authentication and Security Layer: slapd supports strong authentication and data security (integrity and confidentiality) services through the use of SASL. slapd's SASL implementation utilizes Cyrus SASL software which supports a number of mechanisms including DIGEST-MD5, EXTERNAL, and GSSAPI. Transport Layer Security: slapd supports certificate-based authentication and data security (integrity and confidentiality) services through the use of TLS (or SSL). slapd's TLS implementation can utilize either OpenSSL or GnuTLS software. Topology control: slapd can be configured to restrict access at the socket layer based upon network topology information. This feature utilizes TCP wrappers. Access control: slapd provides a rich and powerful access control facility, allowing you to control access to the information in your database(s). You can control access to entries based on LDAP authorization information, IP address, domain name and other criteria. slapd supports both static and dynamic access control information. Internationalization: slapd supports Unicode and language tags. Choice of database backends: slapd comes with a variety of different database backends you can choose from. They include BDB, a high-performance transactional database backend; HDB, a hierarchical high-performance transactional backend; SHELL, a backend interface to arbitrary shell scripts; and PASSWD, a simple backend interface to the passwd(5) file. The BDB and HDB backends utilize Oracle Berkeley DB. Multiple database instances: slapd can be configured to serve multiple databases at the same time. This means that a single slapd server can respond to requests for many logically different portions of the LDAP tree, using the same or different database backends. Generic modules API: If you require even more customization, slapd lets you write your own modules easily. slapd consists of two distinct parts: a front end that handles protocol communication with LDAP clients; and modules which handle specific tasks such as database operations. Because these two pieces communicate via a well-defined C API, you can write your own customized modules which extend slapd in numerous ways. Also, a number of programmable database modules are provided. These allow you to expose external data sources to slapd using popular programming languages (Perl, shell, and SQL. Threads: slapd is threaded for high performance. A single multi-threaded slapd process handles all incoming requests using a pool of threads. This reduces the amount of system overhead required while providing high performance. Replication: slapd can be configured to maintain shadow copies of directory information. This single-master/multiple-slave replication scheme is vital in high-volume environments where a single slapd installation just doesn't provide the necessary availability or reliability. For extremely demanding environments where a single point of failure is not acceptable, multi-master replication is also available. slapd includes support for LDAP Sync-based replication. Proxy Cache: slapd can be configured as a caching LDAP proxy service. Configuration: slapd is highly configurable through a single configuration file which allows you to change just about everything you'd ever want to change. Configuration options have reasonable defaults, making your job much easier. Configuration can also be performed dynamically using LDAP itself, which greatly improves manageability.